Santiago, or Saint James, was a popular saint in Spanish America. This nearly life-sized image of the saint was made in the 17th century in New Spain. Parts of this sculpture were carved of wood, but the sculptor also bundled stalks of maize to create an interior scaffold which was filled out with a kind of paper mâché which seems to have been made with amate (fig bark) paper and then plastered and painted. While only a few such works have survived, this technique may have been used frequently in New Spain, because it meant that such lighter-weight works could be easily carried in processions. Originally, the sculpture of Santiago would have been set on a portable platform called an anda in Spanish, to be paraded through the streets. He brandishes his sword, to smite enemies of the Faith. 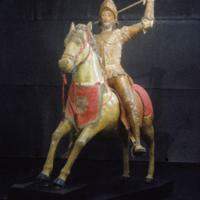 While Santiago’s suit of armor is original, of a piece with the rest of the sculpture, his sword is probably a modern replacement of an earlier one. Like statues of saints, the horse was dressed, and the creation of the elaborate breastplate, which is also not original to the statue, may have been carried out by a woman to honor the church. The stirrups, bridle and other riding gear mimic that of actual riders in Spanish America. 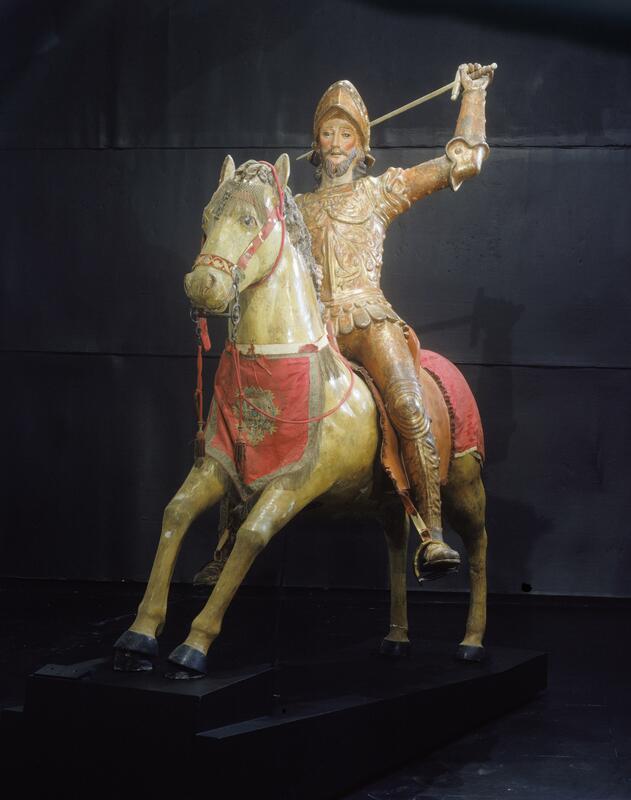 Since fully dressed soldiers were a rare sight in 17th century New Spain, most viewers knew military garb through sculptures like this one. Sculptures of saints were rarely signed in the colonial period. It is no surprise, therefore, that the names of those responsible for this Santiago image are no longer known. This statue was created out of wood from the coral tree (erythrina sp., called colorín in Spanish), along with other light-weight materials, like maize stalks and fig-bark paper. This allowed it to be easily carried out into the streets in ritual processions. While we do not know the name of the craftsman, it was most likely a man (or group of them), who knew well how to combine the techniques of wood carving, plastering, shaping maize stalks, and painting. Originally commissioned for a church, this image would have spent part of its life inside, perhaps installed in a side chapel. It would also have left the church, carried out into the streets in ritual processions. Today, the sculpture keeps company with the largest public collection of colonial art in Mexico, Museo Nacional del Virreinato, Tepotzotlán. James was one of the Apostles of Jesus, and according to legends from the Middle Ages, he traveled as far as Spain to proselytize. And he took on many symbolic meanings in Spanish America. For instance, Saint James (known in Spanish as Santiago) served as example to friars who came to the New World to evangelize. Brandishing his sword, he was also a model of the militant Christian—choosing action above contemplation. Spaniards further believed Saint James appeared to King Ramírez of Castile at the battle of Clavijo in the 9th century, helping the Christian monarch rout Muslim Saracens. Since this reconquista was seen as analogous to the campaigns of religious evangelization in Spanish America, Saint James was brought to life again and again in the dramas of battling Moors and Christians that were frequently staged in the colonial period and sometimes performed in parts of Latin America today. Navarro Castro, F. 1992. “Latin American Iconography of St. James the Killer of Moors.” In America, Bride of the Sun, 500 Years of America and the Low Countries. Pp. 186-196. Brussels: Flemish Community, Administration of External Relations, and Ghent: Imschoot Books. Williams, Jerry. 1992. El teatro del México colonial: época misionera. New York: P. Lang.